On February 7, 1985, U.S. Drug Enforcement Agency (DEA) agent Enrique Camarena was abducted and murdered in Mexico. Camarena, who went by the nickname “Kiki”, worked out of the DEA’s Guadalajara office. His alleged murderer, Guadalajara cartel leader Rafael Caro Quintero, spend 28 years in prison, but was released in August of this year when the courts decided he was improperly tried at the federal and not the state level. His whereabouts are now unknown. This has left Camarena’s widow, Mika, and his former partner Steven Delgado calling for action on the part of authorities. The hope is that the U.S. will put pressure on Mexico to capture and extradite Quintero. The most recent news is an offer by the U.S. Department of State of a $5 million reward for the arrest or conviction of Quintero. "It is extremely disappointing to know that Quintero is free,” Delgado has said, adding that it is frustrating to think that years of effort and sacrifice have come to naught. Camarena’s death was a very high profile event at the time. His wife, who had three children with the deceased agent, received a call from President Reagan expressing condolences, and the murder was the subject of a cover story in Time magazine. For her part, Mika Camarena has since started a program called “Red Ribbon” to warn children to keep away from drugs, saying this is something that her deceased husband would have wanted her to do. 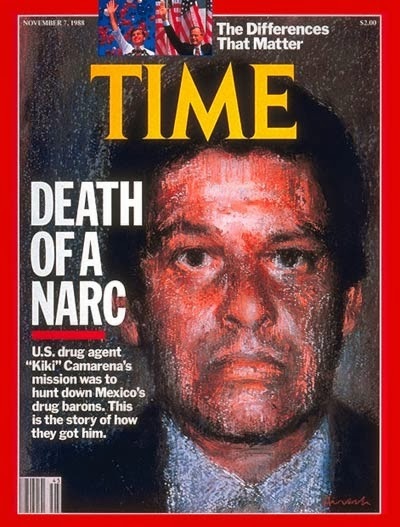 As with many DEA operations in Mexico, there are wild conspiracy theories with regard to the circumstance surrounding the death of Camarena and the capture of Quintero, the most recent being an accusation made by three federal agents that the CIA participated in Camarena’s abduction, torture, and death, allegedly as a result of the agency’s involvement in drug trafficking and its ties to Quintero. Phil Jordan, former director of the DEA's El Paso Intelligence Center, has told Fox News that "In (Camarena’s) interrogation room, I was told by Mexican authorities, that CIA operatives were in there. Actually conducting the interrogation. Actually taping Kiki." Jordan also confirmed what has long been known: that in the 1980s the CIA was involved in the movement of drugs from South America to Mexico and to the U.S. This was in the context of the gun running and drug trafficking operations used to finance the Contras, who were fighting the leftist Sandinista government in Nicaragua. To do this, the CIA had to cooperate with drug lords like Quintero. It seems, however, that the Camarena murder was too much even for the Reagan administration, which shut down the Mexican border to put pressure on authorities to arrest Quintero. Today, however, no such pressure is in evidence, and Quintero is free without any indication that Mexican authorities are eager to bring him to justice. Rob Ford and Justin Trudeau: separated at birth?